To reach the Val d’Ambièz, from the church in San Lorenzo you take the road that passes through the ancient hamlets of Pergnano and Senaso, the latter being one of the hamlets that has, for some years, been mentioned in the travel guide “I BORGHI PIU BELLI D’ITALIA” -the most beautiful Italian villages- (on your right you can admire the picturesque churches of San Rocco and San Matteo) then reaching, along an asphalted road, the Ristoro Dolomiti in the locality of Baesa, from where most of the trips offered by our taxi service depart (you can reach the Ristoro Dolomiti with you own vehicle). From here you can take an ancient mule track as far as Ponte delle Scale (whose name derives from the rocky crags on the left of the valley which give the idea of a stairway). From here the road begins to climb more noticeably until it reaches the Ponte di Broca (whose name derives from the ancient wide-headed upholstery nails called “Broche” that were used to fix wood, likewise, in a lesser way, they were used to stud old leather mountain boots) then continuing under a natural tunnel formed by overhanging and arched rocks that runs along the Ambièz torrent. On continuing, you reach Malga Prato di Sotto, an enchanting old “casera” now used for summer holiday camps, surrounded by spacious high altitude fields where farmers take their animals for their summer mountain grazing; then, passing the junction that leads to Malga Senaso di Sotto, shortly you reach the Cacciatore refuge which, lying in the centre of an amphitheatre of dolomite needles and towers, recalls clearly with its name the stories and legends of the hunters who constructed it, the crackling of the mountain pine logs that dried wet clothes, pink sunrises and cobalt blue sunsets of tiredness and satisfaction. At the Cacciatore refuge the Margonari family await you with typical Trentino cooking and cordial hospitality. 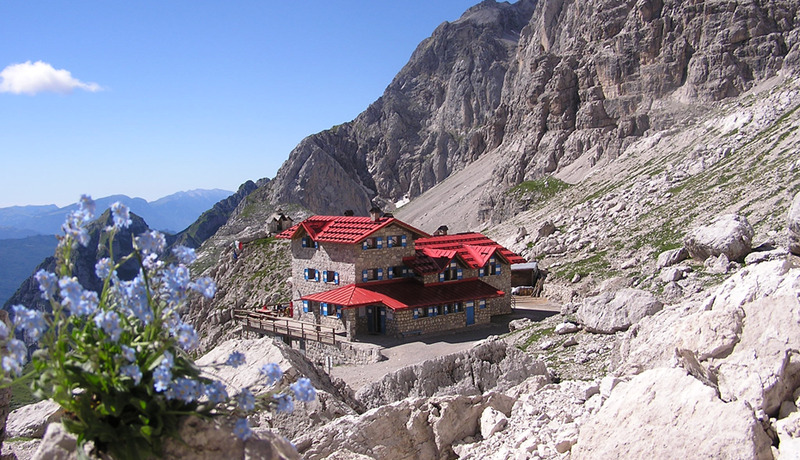 From the refuge you can reach, in an hours walk, the legendary Silvio Agostini refuge, which, since its foundation, constitutes a priviledged departure point for some of the loveliest and hardest ascents that the Brenta group has to offer its enthusiasts. Property of the Società Alpnisti Tridentini, the refuge has been run for years by the Cornell family (now by the youngest son, Roberto) who guarantees all enthusiasts the warmth and comfort that are the fruit of a meticulous and multi decade attention to their guests. This is the starting point for excursions to the refuges Tosa Pedrotti (reached by the ferrata Livio Brentari or the easy footpath Palmieri) and XII Apostoli (reached by the ferrata Ettore Castiglioni), as well as ascents to some of the most noted alpinistic summits such as the Cima Tosa, the Cima d’Ambièz, the Cima Ghez and the Colm Alta. Once you have reached the summits, following the dolomite traverses, it is possible to descend to Madonna di Campiglio (Vallesinella area), to Malga Movlina (Val d’Algone) or to Molveno by way of the Croz dell’Altissimo refuge. From these localities, following the excellent response received by visitors last summer, we can provide a punctual and reliable service for returning to your departure point, or your preferred destination, using a 9 seater minibus. NOTE: all references to the origin of the names of certain localities come from the book “Guida alla Val d’Ambièz” by Giorgio Armani.